She digs pretty deep into the commonality of this dream, interviewing therapists and others about why so many people continue to have it many years after their formal schooling ended. 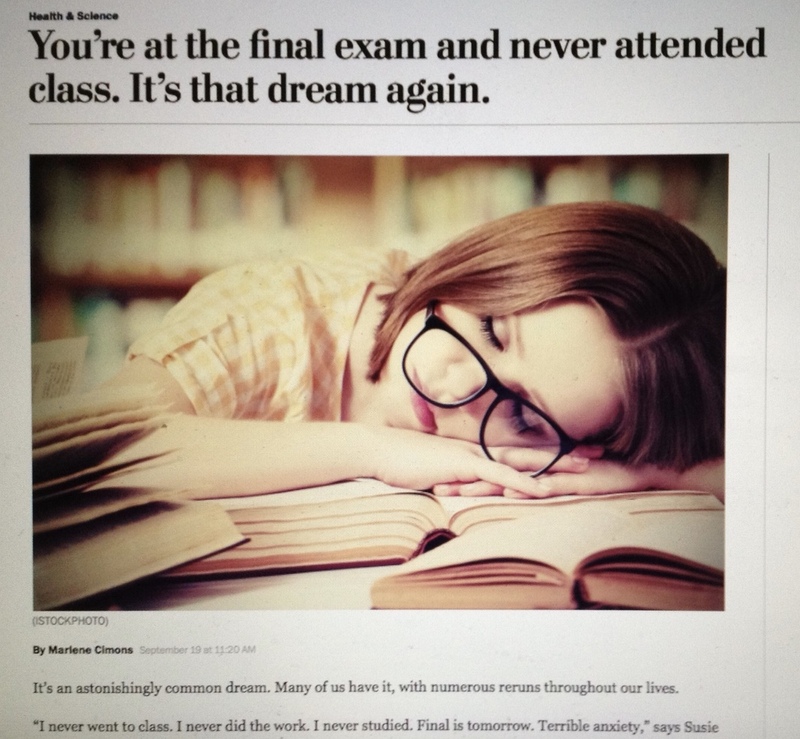 My academic anxiety dream usually is situated in my final semester of college. It’s exam period, and — in keeping with the script! — I suddenly realize that I’m facing a final exam in a course I’ve never attended and for which I’ve never cracked open a book. Furthermore, it’s in a subject area in which I have no interest or aptitude. Oh no, I’m screwed, I dream-speak to myself. I’ll flunk that course and have to take a summer school class in order to graduate. What will my parents say? And what will this do to my law school aspirations?! Maybe I calculated wrong and I really don’t need that class to graduate! At some point I realize it’s a dream and will myself to wake up, but I’m a tad rattled until I confirm that all is ok. The roots of my academic anxiety dreams have some basis in fact. I spent my final collegiate semester participating in Valparaiso University’s study abroad program in Cambridge, England. For some of us, including me, close proximity to one of the world’s greatest universities failed to inspire complete devotion to our studies. Although we were graded on essays rather than examinations, it’s fair to say that work on said written products often got left until the last minute. In fact, one of my two phone calls home during that semester (remember, this is pre-cell phone 1981) came after our grades were reported. I wanted my parents to check my grade report — most notably because of a worrisome Art Appreciation class that I pretty much blew off completely — before I embarked on a post-semester romp through Western Europe. Fortunately my grades were pretty good, except for a barely passing grade in Art Appreciation. Phew…dodged that bullet! It so happens that I’m writing this from Valparaiso University in northwest Indiana. I have a fall semester research sabbatical from my home school (Suffolk University in Boston), and I’m spending part of it at VU as a scholar in residence, working on a book project. I’ll have more to say about this stay in my next blog post. In the meantime, hopefully no academic anxiety dreams will be triggered by this visit. 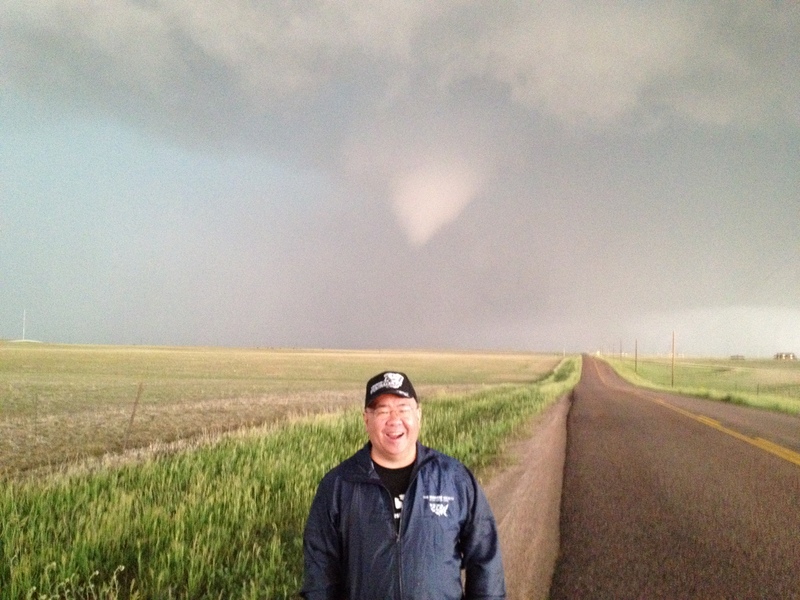 That’s a funnel cloud lowering behind me in Colorado, summer 2012. I had one of my periodic tornado dreams last night. It was, as these dreams tend to be, vivid, dramatic, but not at all scary. In this dream, I was at some type of a program, hosted in a multi-level, homey-type building, when I looked out the window and saw funnels lowering toward the ground. Even though one of the tornadoes passed directly over us, there was no real damage and no one was hurt. I have been fascinated by tornadoes since I was a child growing up in northwest Indiana, and I’ve been having variations of these dreams for as long as I can remember. As I wrote here last spring, in recent years I’ve even gone on storm chase tours to see the real thing. One of the most exciting days of my life was the first day of my first chase tour in 2008, when our group encountered a single supercell in northern Oklahoma that spawned multiple tornadoes throughout the afternoon and early evening. In my case, these dreams haven’t correlated with acute emotional episodes of my life. However, if there is a consistent theme in them, it’s that I’m girded for, but not frightened by, a tornado coming toward me. In fact, I’m utterly captivated. So maybe these dreams are telling me that I’ve got more capacity for change than the comparatively stable life of a professor might suggest. Of course, my tornado dreams may be more transparent than that. The look and power of these storms have had a hold on me for decades. Maybe that fascination simply follows me into dreamland.